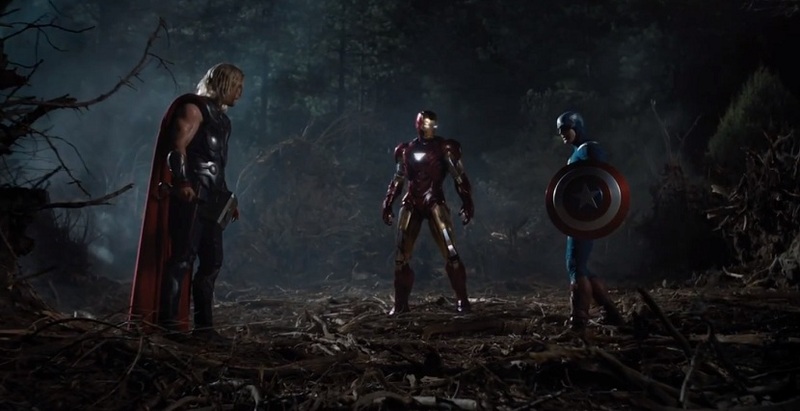 What do you get when you put Iron Man (Robert Downey Jr.), The Hulk (Mark Ruffalo), Thor (Chris Hemsworth), Hawkeye (Jeremy Renner) and Captain America (Chris Evans) in a room together? One big testosterone fueled fighting machine, not to mention an excellent start to the Summer blockbuster season. Marvel's The Avengers has already ranked in a whopping $200M+ opening weekend, domestically. Foreign: over $441M, equaling an incredible grand total of $641,800,000 worldwide. That's a pretty impressive feat considering the production budget was $220M. Our friends over at BoxOfficeMojo foresee it making roughly $420M (domestically). I say it surpasses. We shall see. The story goes something like this: Nick Fury (Samuel L. Jackson), Director of the international peace keeping agency S.H.I.E.L.D., is forced to recruit each hero into a special task force to fight earth’s annihilation using the Tesseract, an untested energy source that will open a portal to Chitauri forces guided by Thor’s demented half-brother, the exiled Loki (Tom Hiddleston - love him). 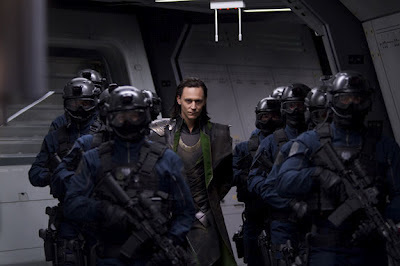 Loki immediately invades S.H.I.E.L.D.’s headquarters and kidnaps, using mind control of course, several of its key scientists, including super archer Hawkeye/Agent Clint Barton. The summer smash hit has everything you could want from a superhero movie and more - try 6 times more. And with 6 times more the muscle you can expect 6 times more the "magic," which is blatantly evident in this blockbuster hit. 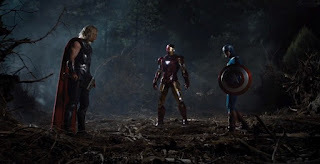 Director Joss Whedon does the seemingly impossible by satisfying each superhero’s fan base while simultaneously dividing out each hero’s scenes in equal fashion. He delivers with thunderous applause and for that we thank you. I thoroughly enjoyed this movie. 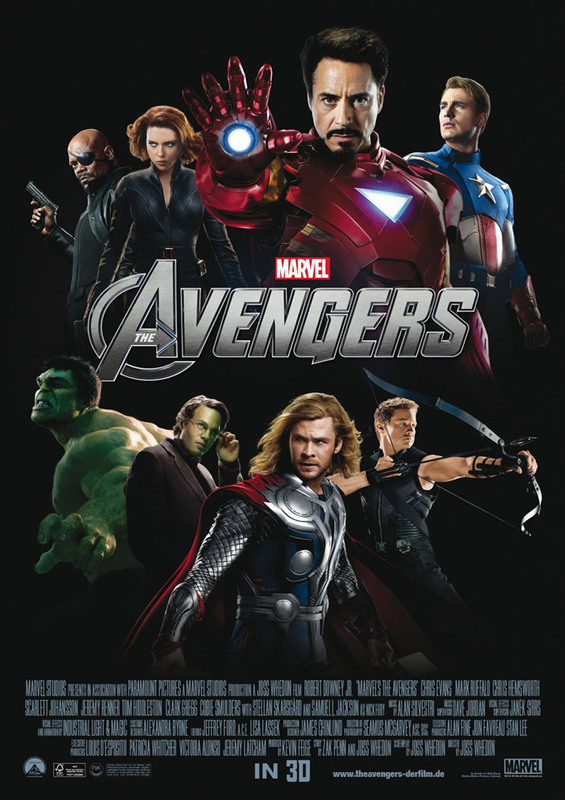 Sure it has some cheesy one-liners, backed with some near impossible action scenes, but c'mon, it's a superhero movie. 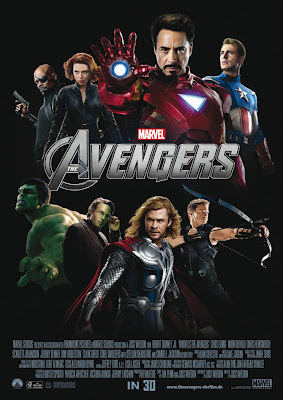 It's fun, funny, exciting, thrilling and above all highly entertaining back with some phenomenal special effects. They definitely left it open for a sequel, which of course will make even more money. My only compliant is that the final battle scene is a bit lengthy and was reminiscent of the final battle scene in Transformers: Dark of the Moon. But we can over look that thanks in large part to the flashy, patriotic driven superheroes themselves. As far as seeing this movie in 3D, I've said it before and I'll say it again, if a movie isn't filmed in 3D (ahem, The Avengers) it's a waste of your money and don't bother. Be sure to stay till the very end of the credits too - some fun stuff. I really liked this movie. I thought it was funny and action packed. I look forward to the next one.